Sometimes I think we may be oblivious to the reality of our condition. How many of us, in Christian churches, are effectively swapping one form of rebellion and independence for another? I like the way Tim Keller put it when preaching from Luke 15. I remember him preaching that the gospel is not about turning younger sons into older sons, that is, turning the rebelliously independent into religiously independent. But that seems to be a common feature of church life. Just recently I was invited to watch a DVD of a well known Christian teacher. He taught from the Bible. He used lots of verses. He sounded very eloquent. But what was he teaching? Effectively he was teaching us to take and apply Bible verses in order to be successful in our fight against certain sins. What’s wrong with that? Well, perhaps nothing, or perhaps a lot if we are thereby feeding our Older-Brother-itis. Bible teaching is not really helping if our goal is to facilitate independent functioning on the part of those who hear. If they are being equipped and encouraged to live independently in their newfound personal holiness, then what is the teacher achieving? Is this really helping people? Ever since Genesis 3 we have been saturated in the brine of independence. Some manifest it by overt rebellion, but others of us are prone to manifest our sinful bent through self-righteousness and personal spiritual “success.” The latter looks so much better, but it can still be a fleshly attempt to push God away and function without direct dependence on Him. I wonder how many of us really grasp the need to repent, not only of the bad things that we do, but also of the good things that we do. Typically a call to repentance will sound like a turn from doing bad to doing good. But true repentance requires us to turn from self and turn to Christ. That will involve turning from rebellion, but also from self-righteousness. After all, my self-stirred religiosity is just another fruit from the same inner orientation toward independence from God. The same thing can creep into our prayer times, both solo and corporate. We can easily fall into requesting of God the resources and wisdom we would need to be able to function with less dependence on him in the future. Surely God is not excited to give us everything we request in order that we can maintain an independent distance as a result? Can this fall into this same independence trap? I think it can. When we make it our goal to offer each other moral stimulation to promote our independent success (think about accountability groups, which can easily slip into this approach – poking each other toward morality, but perhaps not prompting each other toward God himself). I think we would be wise to take stock of the ministry we are involved in: Sunday School, youth ministry, women’s ministry, Sunday church, housegroups, etc. Are we part of creating an environment that really offers Christ and invites people to dependence on and trust in him? Or are we part of sustaining an environment that promotes a sanctified version of the sin problem, a holier remix of independent success efforts? The Bible is not a set of promises given to inform and encourage me to fight my sin and therefore be successful in my godliness. It is there to point me to Him so that in Him I can face all the realities of life and know what life really is. It is not about independent success, but promoting the union with Christ by the Spirit that is knowing God and thereby finding true life. I believe we need to be so careful. It is not that churches deliberately seek to lead people astray, just as that teacher I saw on the DVD was not trying to create a problem for his listeners. But we must recognize that we are so saturated in the brine of independence from God that even Christian teaching and ministry can easily fall into the trap of keeping God at arms length . . . some variation on a do-it-yourself morality. 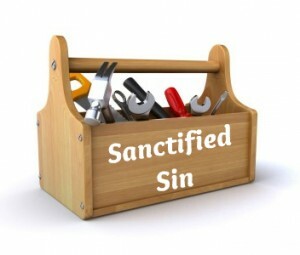 Let’s pray and ask God to shine the light on anything we are involved in that might simply be “sanctifying” the sin problem we swim in.